YOU’LL LOVE COMING HOME TO THIS GORGEOUS NEW RANCH FLOOR PLAN WITH A COVERED FRONT PORCH AND ENTRY. COZY 3 BEDROOM, 2 BATH HOME. OPEN FLOOR PLAN WITH GREAT ROOM IS PERFECT FOR ENTERTAINING! KITCHEN HAS A LARGE WALK-IN PANTRY W/ GRANITE COUNTERTOPS. STAINLESS STEEL APPLIANCES TO INCLUDE REFRIGERATOR, RANGE, DISHWASHER, MICROWAVE AND CHARCOAL CABINETS. PARTIAL BASEMENT, WINDOW COVERINGS, A/C, FRONT YARD LANDSCAPING WITH IRRIGATION SYSTEM AND WING FENCING ARE ALL INCLUDED. CONVENIENTLY LOCATED BETWEEN DOWNTOWN DENVER AND COLORADO SPRINGS. 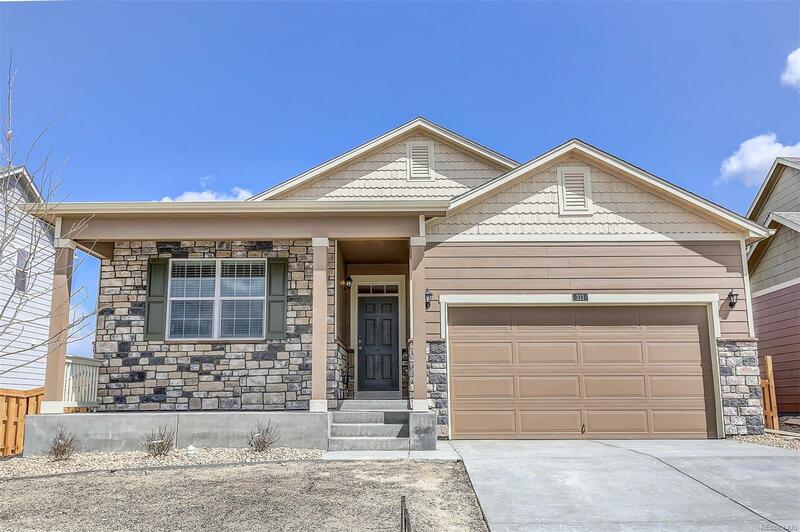 NEW HOME W/BUILDER WARRANTY! IMMEDIATE DELIVERY! PHOTOS NOT OF ACTUAL HOME.